Turn Key Solutions and Sales. 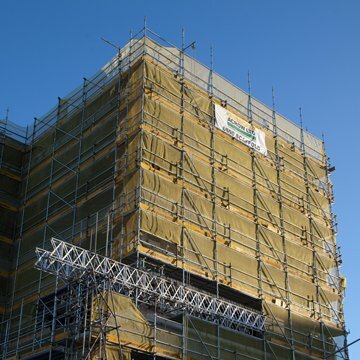 Acrow provides safe, simple and effective scaffold services including full design service, along with a highly skilled workforce for full service solutions. We tailor to your specific requirements, delivering scaffolding to your construction or maintenance programme whether a residential, commercial, industrial, institutional or governmental project. Our services include design, transport, erect & dismantle, alterations, equipment hire and weekly safety inspections. We offer a materials-only hire service and we also offer a labour-only service to install your own scaffold equipment. Contact us to discuss how we can create the right solution for all your scaffolding needs. I’ve worked with Acrow in Auckland over a number of years and they were was also closely involved with Sky’s RWC Host Broadcast team, and basically became our scaffolding consultant for various venues, including Eden Park. Acrow’s eye for detail and initiative were invaluable during the set up of the camera platform requirements for each of these venues. A pleasure to work with. I worked with Acrow on a large project during the Rugby World Cup. The flexibility, innovation and near 24hr a day support I received during this time, could not be faulted. Acrow provided practical solutions to issues as they arose and was a pivotal part in delivering a successful event. Acrow provided us with great service on the Auckland Harbour Bridge. The team performed very well, showing strong safety commitment and getting the job done on time. Acrow is a results orientated company who consistently deliver a good quality product, on time and to within prescribed budgets. Acrow managed the scaffolding on the Auckland Harbour Bridge for two years 2011-2013. During this time they provided a very slick service under challenging conditions, the performance of the Acrow team surpassed all other scaffolders that had been engaged on the job over the last six years.